The Roh'lix Linear Actuator is a device that converts rotary motion into linear motion. The Roh'lix uses rolling element ball bearings that trace a helix pattern along the shaft, which produces a Rolling Helix, or Roh'lix for short. 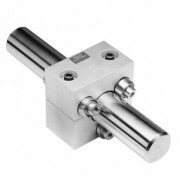 Available sizes have thrust capacities ranging from 67 to 889 Newtons and 15 to 200 lbs, shaft diameters ranging from 8mm to 50 mm and 3/8" to 2", and leads ranging from 0.625mm to 150mm and 0.025" to 6.00". The Roh'lix Linear Actuator consists of six pre-loaded bearings that contact the shaft at an angle. When the shaft is rotated, the bearings trace out an imaginary screw thread, causing the Roh'lix to travel linearly along the shaft. The thrust of the Roh'lix is established by spring force between the two block halves. The thrust force is adjusted by the thrust adjustment screws on the top of the block, allowing the thrust setting to be fine-tuned to individual applications.